Brainstorming: how do we respond to this act of pro-abortion vandalism in Seattle? Not fighting fire with fire. Something better. It’s ironic this anonymous vandal would promote Planned Parenthood over a pro-life pregnancy center when an Illinois woman just died after going to a Planned Parenthood clinic for an abortion (see my previous report here), and considering the news today that yet another woman has been injured during a Planned Parenthood abortion. All these pro-abortion activists seem to think this vandalism is justified because pro-life pregnancy centers don’t present women with all their “choices.” But of course we know it is Planned Parenthood that regularly misinforms, makes distortions, and lies to women about their total range of options (including adoption). After all, what woman doesn’t already know about abortion? Instead, it’s the many, many women who don’t know the full range of abortion alternatives and types of support for pregnancy who need to be reached through effective advertising such as bus and metro ads like this one. 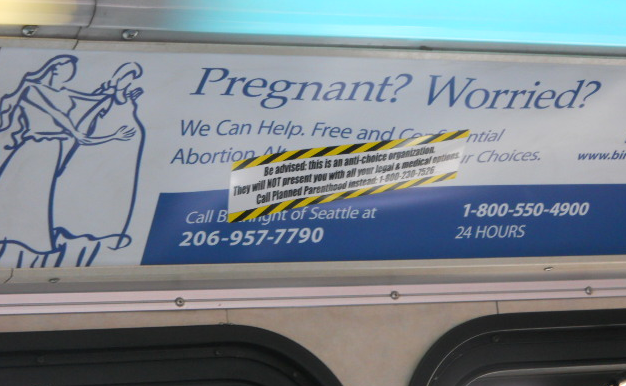 The sticker pretty clearly obscures this bus ad claiming to offer “abortion alternatives,” so how can pro-aborts accuse this pro-life center of false advertising? The Seattle pro-life pregnancy center in question is Birthright. Their local chapter in Seattle is located at 9641 20th Avenue SW (Ph: 206-957-7790). I know, for instance, that they were looking for volunteers this summer. Let’s support this local pro-life pregnancy center! The metro service this vandalism happened on was Metro Transit. I think we should inquire with them if they intend to investigate this act of vandalism (or compensate Birthright for their lost advertising use). We should also contact Planned Parenthood and ask if they condone or condemn this type of vandalism of public property. I’m open to other ways of responding, but these are the top three that come to mind for me. I don’t know about you, but I’m sick and tired of pro-abortion activists gloating after they break the law and endanger more young women (and unborn children!) by harassing legitimate pro-life initiatives.